Welcome to the wild, wacky, and wonderful possibilities of the World Wide Web, more simply called the Web. In this book, we reveal the mysteries of the markup languages that are the lifeblood of the Web — the Hypertext Markup Language (HTML) and its successor along with the Cascading Style Sheet (CSS) language widely used to make the other stuff look good. Because HTML and CSS may be used to build Web pages, learning how to use them brings you into the fold of Web authors and content developers. If you’ve tried to build your own Web pages but found it too forbidding, now you can relax. 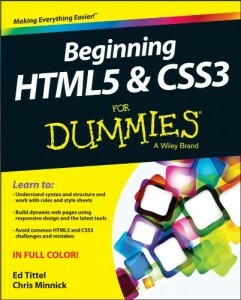 If you can dial a telephone or find your keys in the morning, you too can become an HTML author. No kidding! This book keeps the technobabble to a minimum and sticks with plain English whenever possible. Besides plain talk about hypertext, HTML, and the Web, we include lots of examples, plus tag-by-tag instructions to help you build your very own Web pages with minimum muss and fuss. We also provide more examples about what to do with your Web pages after they’re created so you can share them with the world. This Web site is the companion to our book, and contains hundreds of HTML and CSS examples from the chapters in usable form (including working HTML5 and CSS3 pages) — plus pointers to interesting widgets that you can use to embellish your own documents and astound your friends. Visit the downloads page for more information!